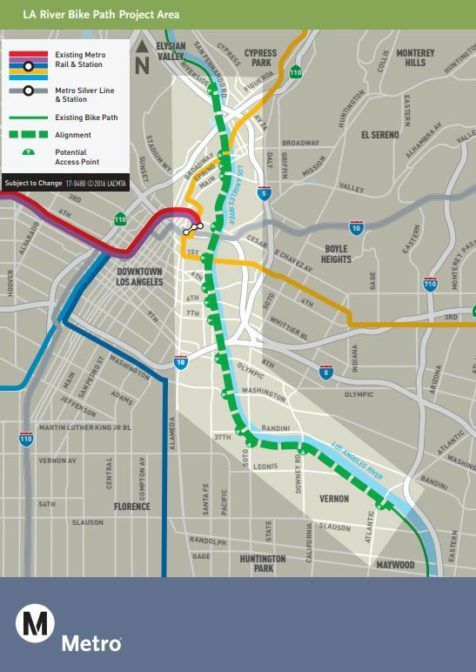 Boyle Heights — Anti-gentrification activists briefly took over a Metro-sponsored community meeting on extending the L.A. River bike path late last month. The Facebook group Defend Boyle Heights posted video (see below) of the dramatic show from more than half a dozen activists, some with black hoodies, black sunglasses and red bandanas carrying protest posters. The 8-mile river path extension would run between Elysian Valley to Vernon. It has close to $365 million in Measure M funding. It’s expected to be completed by 2027. During the meeting at Boyle Heights City Hall on First Street, one of the activists took to his bullhorn to denounce development in the working class community that’s been a flashpoint over gentrification. Much of his speech in front of the small meeting was hard to make out on the video. The audience looked slightly bewildered at first and later taking up their own cell phone video. The anti-development band left, chanting, hitting metal pails ,and one protester posted a fluorescent pink sheet that said “null and void” on one of Metro’s displays. A second meeting was held at the Southern California Institute of Architecture (SCI-Arc) in the Downtown Arts District without interruption, Streetsblog LA reported. Another meeting is scheduled this week in Cypress Park on Thursday, Feb . 7.